Ideal for families and small groups, Entertainer's Dream offers you the best of both worlds, a private, modern house with large outdoor living spaces, bathed in all day sun yet minutes away from stunning beaches, vineyards and the village. Oneroa village, boasting world class dining and convenience with local shops and Oneroa beach is less than 500m away. Little Oneroa with its beautiful beach and playground is a short stroll away. Blackpool beach is a few minutes walk and caters for fishing from the rocks and launching kayaks. 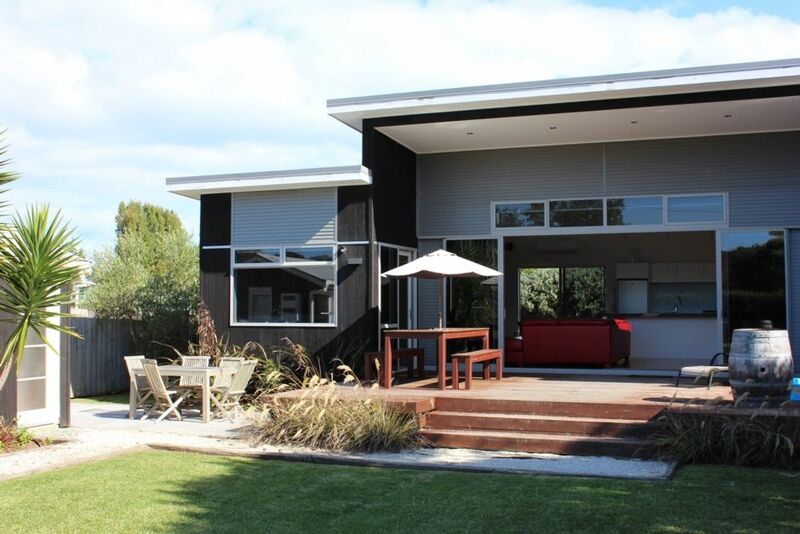 The property is a 20 minute walk to the Matiatia passenger ferry and located on the Oneroa bus routes. Entertainer’s Dream is also perfectly located near to the award winning Cable Bay and Mudbrick vineyards and restaurants which means you don't even need a vehicle. With airy, 4m high ceilings, and opening stacker doors, you can enjoy the sunny days lounging on the large decks and adjourning courtyard to the north of the property, or in the shade of the mature trees hanging over the expansive flat lawn. Fenced off from the road, and complete with a pizza oven, BBQ, kids play gym and outdoor shower this property allows you to make the most of summer living at its best. Inside the property is a large, fully equipped kitchen with Bosch appliances, surround sound, 47" flat screen smart TV, air conditioning and two connected living areas, including a bay window seat overlooking the back lawn and enjoying the late afternoon sun. Great location.Works well with a group. Location is fantastic - a 5min walk to Oneroa beach and village. Location is fantastic - a 5min walk to Oneroa beach and village. The house was immaculate and very comfortable. While we didn't do a lot of cooking, I loved that the fridge and cupboards were stocked with condiments. We would love to visit again one day soon. The house was great, it felt bigger than the photos. The house was great, it felt bigger than the photos. Very clean and great location. Easy walk/drive to main area and vineyards. The property was fantastic - modern, plenty of space and lots of great extras like the kids playground and pizza oven. Very clean and close to beaches, cafes and vineyards. Definitely recommend.